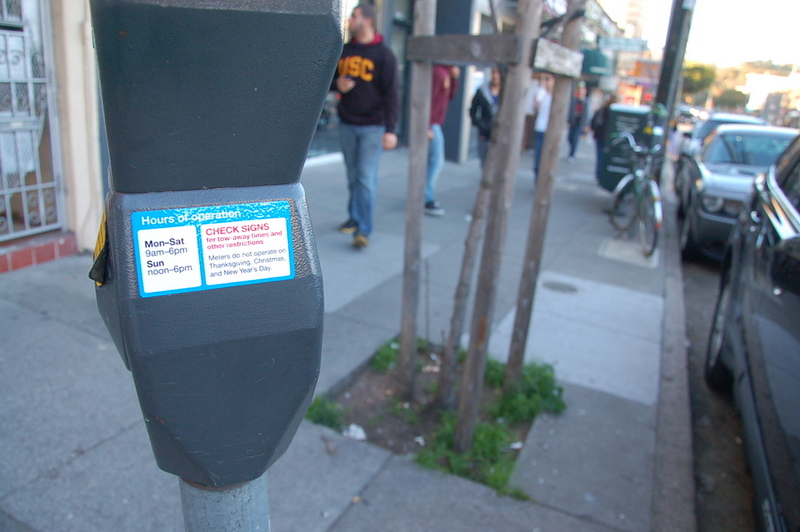 An appeal claiming that the repeal of Sunday parking meters is an action that requires environmental review under the California Environmental Quality Act is baseless, according to responses issued by the SFMTA and Planning Department this week. The appeal, filed by Livable City and the SF Transit Riders Union, is set for a hearing and vote at the Board of Supervisors on Tuesday. The board will not vote not on the merits of running parking meters on Sundays. Instead, the board will vote on whether CEQA would require an environmental impact report for the SFMTA’s new budget, which directs the agency to stop charging for meters on Sundays. The supervisors’ decision is expected to be largely informed by the recommendations of the SFMTA and the Planning Department. The policy change is expected to remove $11 million per year in transit funding, as well as double the average time that drivers take to find commercial parking spaces on Sundays, according to an SFMTA study [PDF] of the benefits that Sunday meters garnered in their first year. The appellants argue that impacts like increased traffic congestion and pollution, reduced parking turnover for businesses, and lost transit funding warrant an EIR. “Our appeal insists that CEQA doesn’t allow an exemption for lowering of parking fees, when such an action would clearly impact the environment,” said Mario Tanev of SFTRU. Even though the SFMTA’s decision to eliminate Sunday parking meter enforcement may have a budgetary impact through the loss of some parking meter citation fines and fees, the SFMTA Budget raises many other rates, fees, and charges which more than offsets the reduction in revenue from operating parking meters on Sundays. “SFMTA’s crass excuse is that because they also raised the Fast Pass and Muni cash fare, it all balances out,” said Tanev. “It balances out on the back of riders, by their own admission.” Over the next two years, monthly Fast Passes will get nine percent more expensive, while downtown parking fines will increase five percent and annual contractor parking permits will increase by two percent. Notably, the board rejected a CEQA appeal in April which claimed that the SFMTA’s pilot program to test private shuttle regulations required a review. But the SFMTA maintains that the act of removing fees (e.g., Sunday meter fees) fits within a CEQA exemption meant to allow for speedy municipal budget balancing. Typically that is something used as an emergency to *increase* revenue, not cut it. Sheesh. “$11 million is not of significant impact”… IIRC that’s more $ than the SFMTA spends on ALL bike infrastructure in a year, hence not that insignificant! Also, more than the Free MUNI for low income youth cost. If you recall the debate about that issue, as far as Sean Elsbernd was concerned, that amount of money was going to bankrupt MUNI. Development Act, Article 3 – Pedestrian and Bicycle Project – $881,721). State grant for bicycle infrastructure. Doesn’t count. Unless we are going to start pointing at you and counting the billion plus Doyle Drive… I think we win that argument. This is ridiculous! This is not a CEQA action, just like how the TEP should not need a multi-year study to optimize transit lines. BUT just based on merits, Sunday metering is warranted, and IT WORKS! Businesses agree, patrons agree, and there is nothing that says you have to drive and park at a meter. Keep the rates congestion priced and set it up to be effective during events, and utilize parking garages and lots. Maybe even run a shuttle from a garage to an event. We have options out there. Don’t engage her. @sebraleaves:disqus has repeatedly proven that she’ll make up whatever “facts” she think will support her cause. Maybe repealing meters without an environmental report is a way to buy drivers votes for the Muni funding measures this fall. Is that a solid fact I can quote? Ed Lee stopped supporting that measure and it’s no longer on the ballot, so we got tricked. Not everyone got tricked. I wasn’t stupid enough to vote for him in the first place. One of the reasons for the TEP taking so long was putting it on hold in 2010 in order to conduct an environmental review for the 10% service and staff cuts in 2010. It was a slight tweak on the standard SFMTA practice of making Muni service worse by cutting funding; instead putting money into purposefully making Muni service worse. Scroll to page 17. They planned for $2.5M in 2013 and $3.3M in 2014 for bike infrastructure. Basically if they earmarked Sunday meter revenue for bike infrastructure we could have 3-4x as many projects a year. Seriously??? So let me get this straight: the bike master plan had to go through an environmental review before a single bike lane, sharrow, or bike rack could be installed, but removing parking meters citywide for 52 days of the year requires no review? What weird alternative universe do we live in? Shame on the Planning department and SFMTA. This is a backwards policy move and EVERYONE knows it. Bad laws cannot stop bad policy. I’d like to know what Brinkman and Ramos think about Sunday meters now that they aren’t getting the VLF on the ballot. Maybe they think the GO bonds alone are worth the parking disfunction and loss of sustained revenue from reversing Sunday meters and better parking policy in general. Works? Based upon – 47 million in Ticks? It favors very large business like Trader Joes and Safeway (that have parking) and hurts small bizes that lose customers to Daly City where, like the other 99% of the country, don’t ticket people on Sunday. Further, ride along south of market where 40% of metered spaces are not used on the weekend and tell me this “works” (translation – it works for you). I rarely go near my car on the weekend, greatly perfering to walk or ride. But this law was always about $$ not good policy..
Bring back Sunday meters than get more cars roaming around causing more negtive impacts….slowing muni…. Leave it as no meters than we okay.